Spiridon (Zahle and its dependencies), Georges (Jbeil, Batroun and their dependencies), John (Lattakia and its dependencies), Elias (Beirut and its dependencies), Iliyya (Hama and its dependencies), Elias (Sidon, Tyre and their dependencies), Saba (Hawran and Jebel al-Arab), George (Homs and its dependencies), Siluan (Buenos Aires and all Argentina), Basil (Akkar and its dependencies), Ephrem (Tripoli, al-Koura and their dependencies), Ignatius (France and Western and Southern Europe), Isaac (Germany and Central Europe). The patriarchal vicar, Bishop Ephrem Maalouli, secretary of the Holy Synod, was in attendance, along with the Synod’s record-keeper, Economos Georges Dimas. The following bishops were unable to attend: Antonio (Mexico, Venezuela, Central America and the Islands of the Caribbean), Sergio (Santiago and Chile), Damaskinos (Sao Paulo and Brazil), Paul (Australia and New Zealand), and Joseph (New York and North America). Metropolitan Paul (Aleppo, Alexandretta and their dependencies), absent on account of his captivity, was present in the prayers and supplications of the fathers of the Synod. His Beatitude briefed the fathers about his pastoral visit to the regions of Wadi al-Nasara and Safita, which concluded in the Archdiocese of Akkar, where he had the opportunity to meet with his children and become familiar with their aspirations, concerns and anxieties. His Beatitude expressed his great happiness and pride for his children, who are bearing witness to Christ risen from the dead in this part of the world and transmitting their faith from generation to generation in faithfulness to tradition and openness to the future, rooted in the land and holding fast to the values of the Gospel. His Beatitude thanked His Eminence Metropolitan Basil (Akkar), the bishops and the priests for their pastoral care of their children in this region, along with all the faithful who worked hard for the success of this visit, which allowed our father the Patriarch to meet with his children in an atmosphere of love, intimacy and simplicity. The fathers likewise reviewed the work of the preparatory committee for the great Orthodox council which met in Chambésy, Switzerland at the beginning of October, 2014 and took note of the working paper that it prepared regarding the relationship between the Orthodox churches and the Christian world. In this regard, the fathers expressed their hope that the preparatory work for the great council will be effective for a united Orthodox witness in today’s world which thirsts for a word of life. 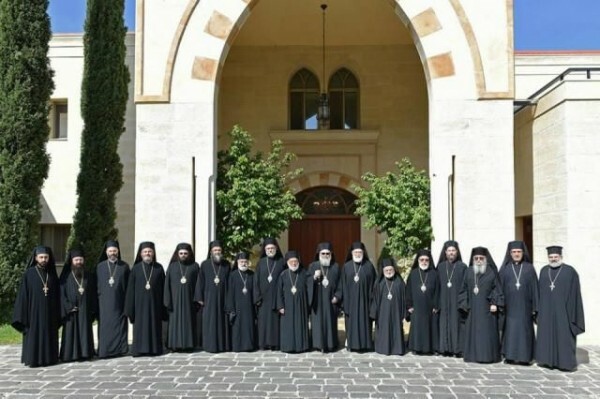 The Holy Synod likewise took note of the recommendations brought to it by the committee that it delegated to reviewing the work of the general Antiochian conference held in June 2014. It decided to charge His Beatitude with forming a specialized committee to put into place a medium-term strategic plan that will take into account what recommendations can be implemented according to Antioch’s priorities, available human and financial resources. This plan should also anticipate the dangers that implementation could face and ways to avoid them. As soon as it is prepared, the plan will be presented to the dioceses for comment. It will then be presented in its final form at the next session of the Synod in order to take necessary action. Concern for Jesus’ little brothers was not absent from the fathers of the Synod, who reviewed the relief work being undertaken by the Patriarchate in order to lessen the impact of these evil days upon the needy. The fathers praised the efforts being made in this regard and blessed those undertaking them. They praised those who are giving generously to help those in difficult circumstances and called on their children to work together to lessen the impact of these difficult days in response to the commandment “bear one another’s burdens”. The fathers of the Holy Synod decided in this regard to conduct a survey and ecclesiastical census at the level of the See of Antioch in all dioceses in the homeland and the diaspora with the goal of better pastoral care and communication with them. The fathers reviewed the situation in the dioceses, especially the vacant diocese of Baghdad and Kuwait. They elected Bishop Ghattas Hazim as metropolitan of the Archdiocese of Baghdad, Kuwait and their dependencies. They also elected Archimandrite Gregory Khoury-Abdallah as an auxiliary to His Beatitude the Patriarch with the title of Bishop of the Emirates and Archimandrite Qais Sadek as an auxiliary bishop to the patriarch with the title of Bishop of Erzurum. The fathers lingered with great sorrow and regret on the mystery that still surrounds the case of Metropolitans Yuhanna (Ibrahim) and Paul (Yazigi), who were kidnapped a year and a half ago, amidst the world’s blind eye and silence about this legitimate humanitarian issue. In this regard, the fathers called upon world and Arab society to work seriously to uncover the fate of the bishops, priests, soldiers and civilians who have been abducted. The fathers lingered on the ongoing tragedies that are afflicting the Middle East and attempting to tear apart its social fabric, wipe out its ancient cultures and enslave its people to violence, fear, misery and ignorance. They stressed that Christians are children of the Middle East and its builders, not visitors or newcomers there. They affirmed that they will remain there as witnesses to Christ because they believe that God embraces all and that He is able to lift them up from this historic impasse that they are experiencing. The fathers likewise reminded their children that Christ who rose from the dead and conquers death by death is alone the true guarantor of their existence. They called on them not to approach the crisis sweeping their countries from a sectarian or minoritarian logic because this crisis is not a confrontation between religions, but rather between the interests of the powers of this world who exploit religions as a vehicle for their whims, while the religions are innocent of them. The fathers affirmed that the active Christian presence in the Middle East remains a presence open to Muslims and constantly struggles alongside them for freedom, peace, true citizenship and human dignity and development. It is a presence that rejects extremism and terrorism and clings to this land that was formed by the blood of its sincere children and watered with the blood of the saints who lived there. They laud the positions recently issued by Muslim intellectuals and call on them to realize the necessity of developing a clear teaching that recognizes freedom of religion. The fathers prayed for Syria and Lebanon and encouraged the international community to work seriously for peace in Syria, whose people are paying an exorbitant price to the language of interests, killing, terror and takfir. They encouraged members of the Lebanese Parliament to elect a president for the Republic who will ensure the constitutional regularity of work there. They prayed that the language of peace will replace the language of confrontation in Iraq, Egypt, Palestine and all parts of the Middle East. The Antiochian presence throughout the western world was not lost on the fathers. They expressed their appreciation for their constant, living witness rooted in their home countries and especially their solidarity with their brothers in the Middle East during these delicate and fateful circumstances. The fathers praised the singleness of spirit that brings all together and the constructive work in which the mutual spiritual, human and cultural complementarity between them is made manifest.